Remember the size 0 (whatever) corduroy jacket I scored at Swap-o-rama-rama for D? She got to wear it today! It's so cute. 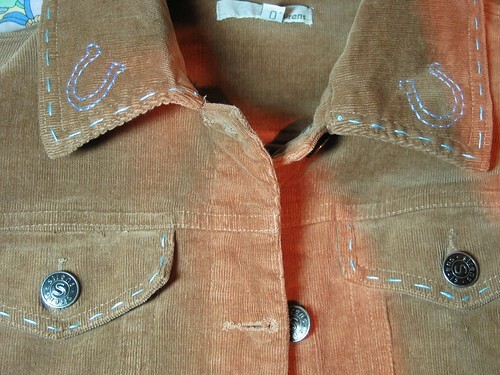 I spiffed up the collar & pockets with some running stitch and at D's request, some lucky horseshoes. And look at the back - I think I'll make her walk in front of me at all times just so I can admire my own **smirk** handiwork! 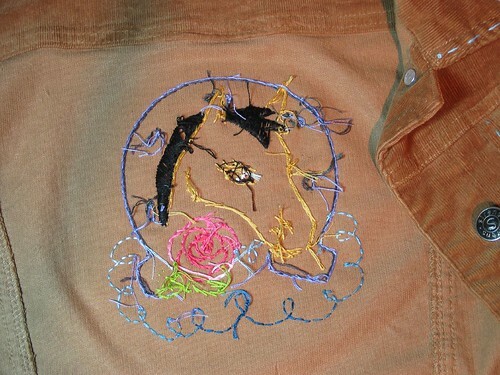 I stitched out a Sublime Stitching iron-on transfer from their uber-cool craftpad. The inside of the jacket ended up looking a little messy. 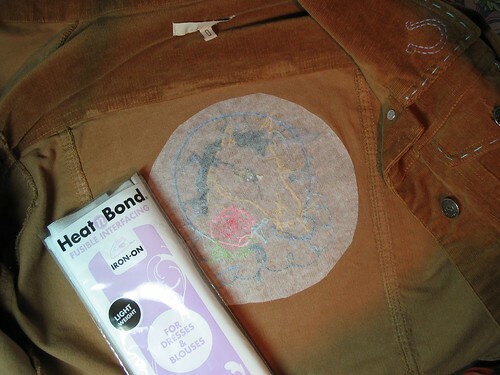 So I decided to cover it all up and protect the knots and tails with a light-weight fusible interfacing by Heat'n Bond. This is a new product that I wanted to try. I have heard horror stories about the 'old' Heat'n Bond but I believe in R&D (it's the scientist in me, I guess) and figured I could risk 5 bucks on a new product. Verdict: it's great! It didn't melt under the awesome heating power of my old Rowenta iron, it fused completely and remained pliable (not stiff and crispy). Phew, $5 well spent. Next I'll try it on the back of my stitcheries. I like to back my embroidery projects with products like this that don't add any weight, but effectively hide any threads that are carried from one design element to the next, across the back....saves on knots & tails! I am now heading to my sewing room. I am still working on my giveaway gifties for you (coming soon, I promise!) and a couple of swaps. But before I go, here's a plug for a fun giveaway at 44th St. Fabric (it's a Where's Waldo kind of giveaway - go play, it's not hard, honest). Best part? You could win 6 YARDS OF HUSHABYE by Tula Pink for Moda!! Hope the sun in shining on your weekend. My Lily would think that jacket was the coolest. She is big into horses this year (she is 4 so I imagine that she will be for some time yet). You did a great job. Thanks for the review on the Heat n Bond. I have never used it on the back of stitcheries but I think I will have to give it a try. The jacket turned out so cute; I bet your daughter is really happy! Great idea to cover the back of the embroidery like that. 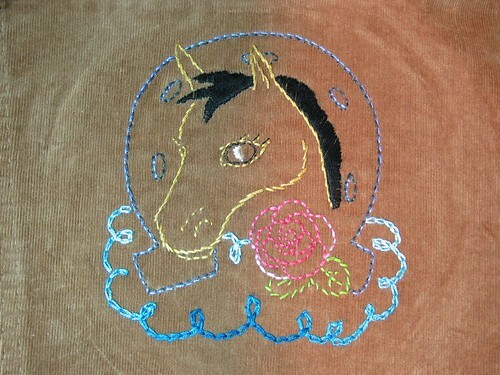 I loved the horse on the jacket...all of it is just lovely! I love the jacket! How cool! Great job on the stitchery Krista. 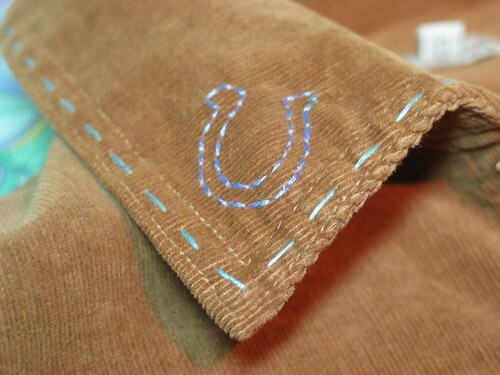 The second line of stitching on the horseshoe really did the trick it's Fab! Thanks for H&B review too. I wasn't a big fan of the older stuff as you know but it sounds like the new product is worth a try. I bet D looks great in her new threads!